Generally feeds on lucerne, occasionally on other medics and rarely on clover. Adults are greyish-tawny brown, slender weevils about 5 mm long with distinctive light-coloured stripes running down the thorax and extending onto the wing covers. They have short blunt snouts. The adult weevils can be very common in lucerne when they emerge from the soil in mid-summer and when they fly to summer resting sites away from lucerne crops. 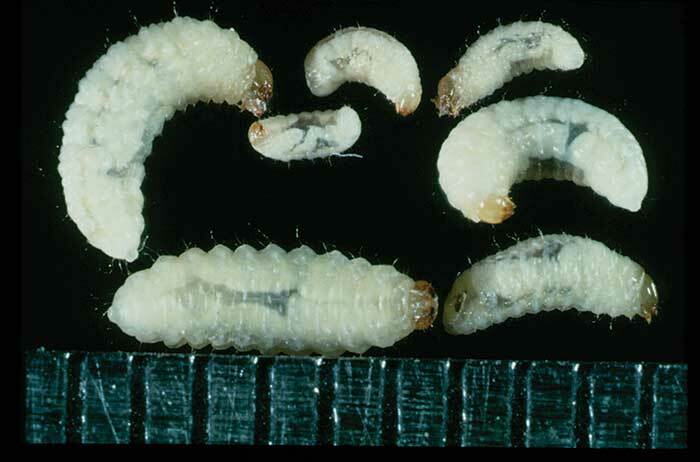 Larvae are soil dwelling white legless grubs up to 5 mm long. They are most easily observed in late spring feeding amongst the lucerne root system. Lucerne weevilwas accidentally introduced into New Zealand in the early 1970s via Australia having originated from Morocco. It rapidly became widespread and common where ever lucerne was grown. Although lucerne is the primary host plant it also feeds on medics and rarely on clover. Adults emerge from the soil in December/January and feed voraciously for a short time in order to develop flight muscles and to become reproductively mature. They then fly away from the lucerne stands, congregate along hedge rows and at the base of fence posts or other similar structures and enter an aestivation phase (summer equivalent of hibernation) that lasts for 7-8 weeks during which the adults are inactive and do not feed. 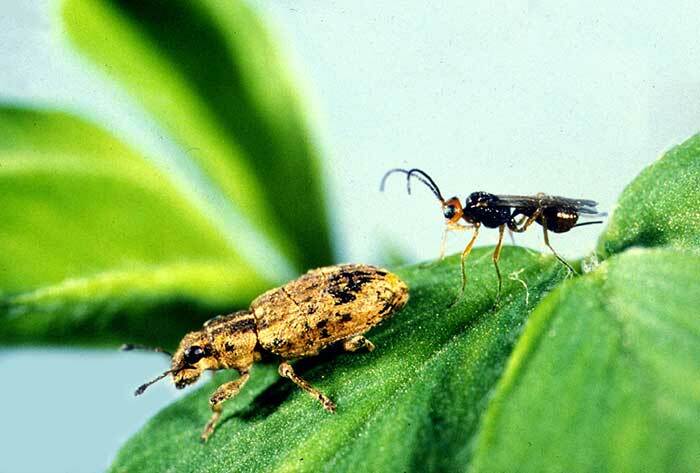 The weevils break aestivation and fly back to lucerne crops beginning in late March and peaking in mid-April. The weevil is a strong flier and can disperse widely in the search for lucerne. Adult weevils are present in lucerne stands from autumn onwards but become less common in spring as overwintering adults die. Egg laying begins in May and goes through to October but it is mainly eggs laid in spring that give rise to the next generation. Each female weevil can lay several hundred eggs which are scattered over the soil surface. When these hatch the young larvae burrow into the soil seeking out lucerne root nodules. Larvae begin appearing in October and are most common in mid-November after which time pupae can be found in the soil. Small larvae feed within root nodules but as they become larger they also feed on the lucerne roots. Adult weevils are commonly found away from lucerne in pastures and other grasslands but usually in very low numbers. Lucerne weevil is a pest of medics (Medicago species) and can be a significant pest of lucerne (Medicago sativa). Both adults and larvae can cause economic damage. Adults attack the foliage, with feeding characterised by `scalloping’ of the leaf margins. This is most often seen during December to January, coinciding with mass emergence and feeding of new generation adults. Although of a short duration this can result in mid-season production losses of up to 20-30% and large infestations can result in complete defoliation of plants. Larvae initially feed on the nitrogen-fixing root nodules. As they get older they move out of the nodules and attack the general root system. Larval feeding can induce plant dormancy and cause plants to become nitrogen deficient. Repeated larval attack may lead to reduced plant vigour and increased susceptibility to damage from other sources. Yield losses of up to 43% have been recorded from larval feeding with the effects lasting for up to 3 months. In 1982 a parasitoid wasp, Microctonus aethiopoides (Moroccan ecotype) was released against lucerne weevil. It established successfully and is now widespread throughout New Zealand. The female wasp injects a single egg into an adult weevil, rapidly sterilising it. The weevil continues living until the wasp larva completes its development inside the weevil and after 3-4 weeks emerges to form a cocoon in the litter/soil surface. The weevil dies shortly after. Each female wasp can attack up to 60 weevils in her lifetime and several generations occur between spring and autumn. The wasp has proved to be an efficient biocontrol agent and is generally so effective in supressing weevil populations that insecticide control is usually unnecessary. As with all biocontrol systems there are instances where lucerne weevil populations temporarily outstrip wasp numbers and damage can result. In such cases recourse to insecticides may be warranted. 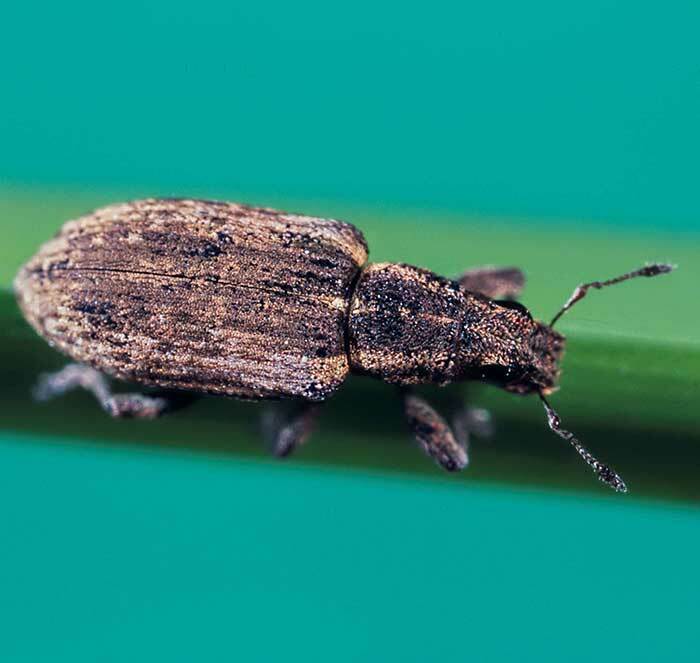 The most effective strategy for insecticidal control of lucerne weevil is to treat against adult weevils returning to lucerne stands at the end of autumn, killing the adults before the bulk of the egg laying takes place and limiting the spring larval population to below damaging levels. However this may disrupt biological control and should therefore only be used when damage is severe. Control of the larvae is very difficult because they are protected in the soil and root nodules from either drilled or surface applied insecticides. Seedling stands can be attacked in autumn and due to small plant size can be particularly vulnerable to adult feeding. A foliar insecticide can be applied if necessary at the first sign of damage. Refer to the NZ Agrichemical manual or your local agrichemical representative for more information on insecticidal control. This pest was initially misidentified in Australia and New Zealand as Sitona humeralis and in some publications is referred to by this name. Barlow ND, Goldson SL 1993. A modelling analysis of the successful biological control of Sitona discoideus (Coleoptera: Curculionidae) by Microctonus aethiopoides (Hymenoptera: Braconidae) in New Zealand. Journal of Applied Ecology 30: 165-178. Goldson SL, Proffitt JR, McNeill MR 1990. New Zealand seasonal biology and ecology of Microctonus aethiopoides (Hymenoptera: Braconidae), a parasitoid of Sitona spp. (Coleoptera: Curculionidae), with special emphasis on atypical behaviour. Journal of Applied Ecology 27: 703-722.